Dr. Perricone is a leading dermatologist who we are told has a rather impressive client list. He has long since been creating lotions and potions in a bid to rewind the wrinkle clock and one of his more recent creations is the infamous No Foundation Foundation. Now, to begin there has been many an internet feed dedicated to debating whether this product is in fact a foundation or a tinted moisturiser. The fact it gives a very light and dewy coverage does echo tinted moisturiser vibes, but never one to discount the obvious, the fact Dr. P has called it a foundation means I’m adding my vote to the foundation pile. Dr. Perricone came up with this formula in response to a number of requests from celebrity make-up artists for a foundation which would let the skin’s natural radiance shine through. What he actually came up with was above and beyond the original request and promises not only dewy and flawless looking skin without a heavy matte finish, but also a reduction in pore size, fine lines and wrinkles. The unique anti-ageing complex also smooths lines, boosts the skins natural moisture and soothes and calms sensitive skin (all with spf30). First things first is the bottle, which upon first glance is really quite nice. It’s a nice size, frosted brown with a pump (or lid) and a no fuss but sophisticated looking label. Aesthetically it looks good for you and organic which we hope is an indicator of what awaits us inside. 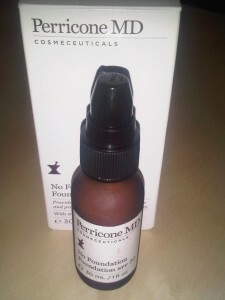 The formula itself is slightly runnier than the ‘usual’ foundation or moisturiser and is more fluid based than cream. We applied two pumps for daytime coverage and though you can build it up a little more, you could probably use the entire bottle and still not achieve what many would consider to be ‘full’ coverage. It blends beautifully, it feels good on the skin and though it’s not matte and only offers a light and dewy finish it really evens out the skin tone and hides imperfections. After using twice a day for just over a week there was a noticeable difference in my pores which continued to improve over the course of the next few weeks and in weeks 3 and 4 I did notice my pesky laugh lines diminishing slightly! Though all of this comes in at budget busting £41 for 30ml, after using 4 pumps a day for over a month we still have half a bottle remaining, refined pores and less wrinkles, so as the saying goes You get what you pay for! You can purchase Perricone MD No Foundation Foundation from Harrods online.